I’m never completely at home with a post-modern subject. I find the lack of ornamentation actually makes it harder to draw. Where are the gargoyles and Gothic arches? I’m supposed to draw these concrete abstractions? 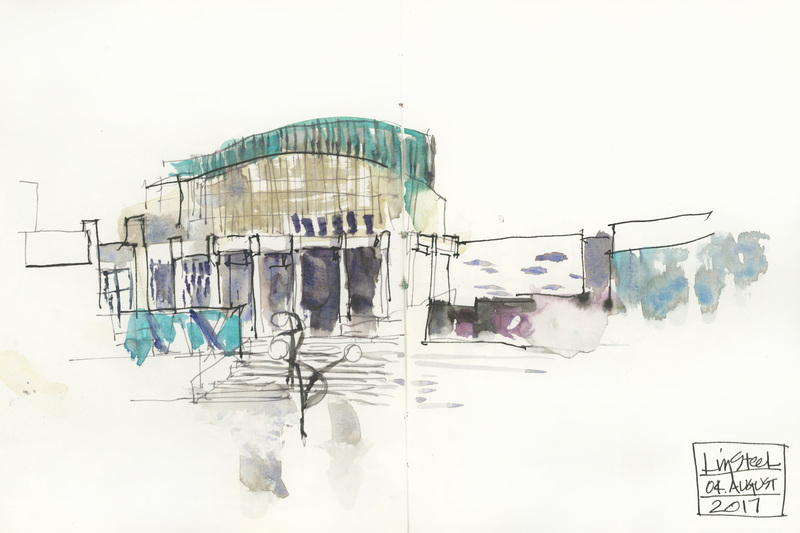 Originally I was going to trash my drawing of Place Des Arts (our performing arts plaza in Montreal) – except, afterwards I saw my friend Liz’s version. What struck me is – while the drawings are somewhat different – the way we each simplify the view is fascinating in it similarity. Isn’t it interesting to compare two different artists seeing the same abstract patterns in the curving concrete and dark panels of glass. It’s very hard to find any perspective cues in this post-modern structure, so we’ve both approached it in the simplest terms – a pattern of light and dark. ← Announcing: Watercolor Workshop Dec 2, in Stowe Vermont! Marc…you “trash” sketches??? Your worst ones are museum-worthy compared to my best ones….and calling them “best” is a stretch. Marc, I love the free spirit of these sketches. I would consider these some of your best work. DO MORE! Love the different approaches. These are amazing. Thanks for posting these along with the photograph. The comments are all interesting. I have torn out sketches I couldn’t bear to have anyone see, not even myself. (especially myself?) You always read or hear that you should keep all your work and compare your progress. Can’t do that. Great sketch!! Glad you didn’t trash it and glad you broached the topic. I made the claim yesterday that urban sketchers tended not to like drawing modern buildings and your post made my point today. Would love to know what others think. Absolutely! It always feels like there’s less story to be told than with a historical site. Plus, the lack of decorative elements – (pictorial ones anyway – I suppose it’s the light on form or surfaces that we’re admiring these days. Having big, blank textureless areas or walls is always challenging. It’s like a frame with no painting in it, and in many cases even the “frame” is textureless and flat. These are the ones that I try to focus on temperature changes and broken colour within those large areas to help create visual interest. Splashing or spraying paint into some areas helps create an abstract texture as well.